We’re very excited to announce that on Friday 20th May from, 1-2 pm, as part of Mental Health Week, we’ll be holding a live Q&A on Twitter with our Peer Support team. Tweet your questions using #AskPeerSupport. The Peer Support team will be taking over the @WeAreSelfHelp Twitter account for 1 hour. As a user-led organisation, many of our staff and volunteers have personal experience of mental health issues, therefore Peer Support is at the heart of what we do. This is what makes our charity so unique! 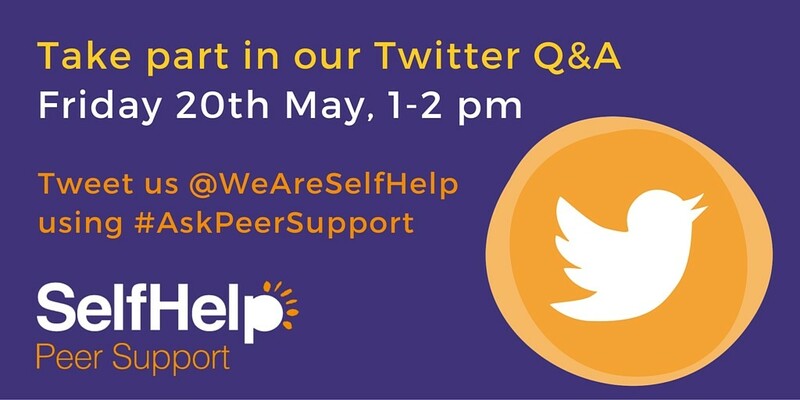 Our Twitter Q&A will be your chance to ask the Peer Support team anything you would like to know about how to improve wellbeing. To participate, all you have to do is tweet your question ensuring you include the hashtag #AskPeerSupport. The team will re-tweet the question before one of them answers so everyone can follow the Q&A. During the hour, the team will be available to answer all of your questions. If you’re not on Twitter, click here to sign up. Once you’ve signed up, or if you already are, just follow @WeAreSelfHelp.